Got any chanterelles left? I still find them at the markets here, so hopefully you can too. Because if you do, this is the dish to make. It really, really is. It's so lovely, so fall-ish and so full of both color and flavor that you really owe it to yourself to make it. It'll cheer you right up - I promise! The recipe comes from Ica, one of the largest grocery stores in Sweden. I've changed a few minor things, but it's still pretty much the same. You can serve this with anything you like, but I loved it with a potato-sunchoke gratin that I plan to give you the recipe for soon. Brown the tenderloin all over, in some of the olive oil. Season with salt and pepper. Remove it to a warm oven (175°C) and let it finish there for 20-25 minutes. Dice the garlic very finely, and mix with balsamic vinegar and honey in a saucepan. Add a pinch of salt and pepper, and cook until reduced and syrupy. Dice the pancetta and apples. Fry the pancetta until it's crispy, then add the chanterelles. Finally, add the apple and rocket. Slice the tenderloin and arrange on a platter. Drizzle with the balsamic glaze, and top with the chanterelle-pancetta mixture. Sluuuta, jag blir huuungriiig! Jag som ska laga fläsk till middag också, fast med nå fikon och krejjer (hail Arlaköket). Vilken fredagsmat! Ser jätte-gott ut! Tur man plockade mycket kantareller i höstas. Trevlig helg! Thank you for this amazing recipe! 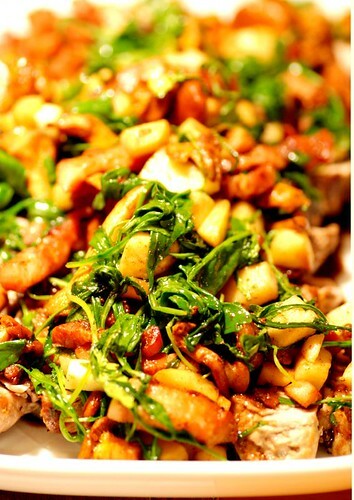 I happen to have a friend that picks chanterelles, can't wait to try them in this recipe. Instead I had a truly awful hotdog at my daughter's school Christmas fair and now I wish I hadn't eaten anything at all. Oh wow, this looks amazing! I can't believe I just found this recipe - I came across a beautiful batch of chanterelles yesterday, and was wondering what special recipe I should fix around them... You just answered my question! I love chanterelles but haven't had much luck finding them this season. Clearly I have to go to more farmer's markets. I shall keep this in mind though since it looks perfect for me. Oooh, I like the sound of that glaze! I use various combinations of honey and balsamico for glazing everything from pork chops to salmon. This recipe sounds like a winner - thanks!